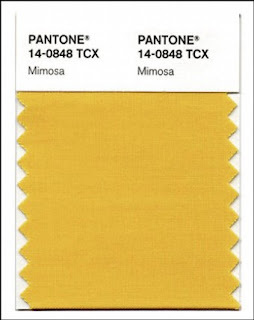 CARLSTADT, N.J., Dec. 3, 2008 – Pantone, an X-Rite company (NASDAQ: XRIT), and the global authority on color and provider of professional color standards for the design industries, today announced PANTONE® 14-0848 Mimosa, a warm, engaging yellow, as the color of the year for 2009. In a time of economic uncertainty and political change, optimism is paramount and no other color expresses hope and reassurance more than yellow. I love yellow. I don’t wear it. My house does! One thing is for sure; folks have strong feelings about yellow. Love it or hate it, its the color of the year! I won’t be wearing it (I’m blonde…HELLOOO?) but I will design with it. Its a happy color. I am a ridiculously happy person….with a “sunny disposition” (or so I am told) so it suits me. I did a personality profile once that defined by color, and I was a YELLOW…the official color of cute. I have been told to “drop the cute thing” but I just CAN’T. Its who I am! It’s like removing a vital organ…not gonna happen. No matter how sleek or sophisticated I want to be, I can’t shake the “cute” thing. One of my friends and probably the best designer on the planet, told me “You have got to get past this cute vibe-thing!” Sorry, Hitomi! You ARE sleek and sophisticated, and as much as we have tried, you can take the girl out of the cute, but not the cute out of the girl. It was a valliant effort on your part, though. And I toned down ‘cute’. And I learned alot from you. But I am still “cute”. Or so they say. Yellow IS cute, a hard color to take seriously. Nobody has a yellow power suit. The only yellow suit people I know is that guy from Curious George. His life was controlled and wrecked on more than one occasion by a freaking monkey. Perhaps if he didn’t wear so much yellow, things would have gone better for him. Poor schmuck. I am definitely not adding yellow to my wardrobe. Yellow in my closet? Not going to happen.